Ole Blue arrived without a motor and the engine we purchased had most likely spent is former life in a welder application. But an L-134 is an L-134 and the engine got us on the road. However, the engine smoked, we had some oil pan issues and even after an oil pump change we saw very low pressure. More critical was a noise from the clutch. We had picked up a rebuilt L-134 engine with the idea of doing a swap and fixing the clutch. Like many of our projects, this one took some time, but we did get the job done. Since this was an engine swap, we took advantage of the jeeps simple constructions. By removing the fenders, grill and radiator, we had easy access to the engine. We did have to remove all the wiring in the front end, but again, the jeep is a simple vehicle. The most important tool at this point is an engine hoist with a load leveler the attaches to the head bolts. The second most important tool is a digital camera to take lots of pictures, especially of the wiring, to aid in the reassembly. With only a couple of “hum, why isn’t it releasing”, the engine came free of the bellhousing and the transmission shaft. We had chosen to unbolt the engine from the front mounts. Hindsight tells us that should have unbolted the mounts from the frame. We had to “lift” the front of the block, thus binding the engine on the shaft more than necessary. A quick look at the throw-out bearing and transmission shaft showed no wear or problems. So the next task with the engine out was to remove the clutch. As soon as the pressure plate was removed, the source of the clutch noise was evident. The springs on the clutch disk had made contact with the bolts on the flywheel. Our installation way-back-when was our first and we assumed that the flywheel that came with the engine was the correct one. With the new engine setting next to the old, the difference in the flywheels was obvious. The old flywheel had been machined in the middle, lessening the clearance for the clutch disk. So the good news was that we weren’t facing a major problem. We had, not knowing what we might find, ordered a complete new clutch assemble. We could have gotten by with just a new clutch disk, but at this point replacing everything seemed the wise path. The flywheel on the new engine was very rusty. We decided to remove the flywheel to get it cleaned off. 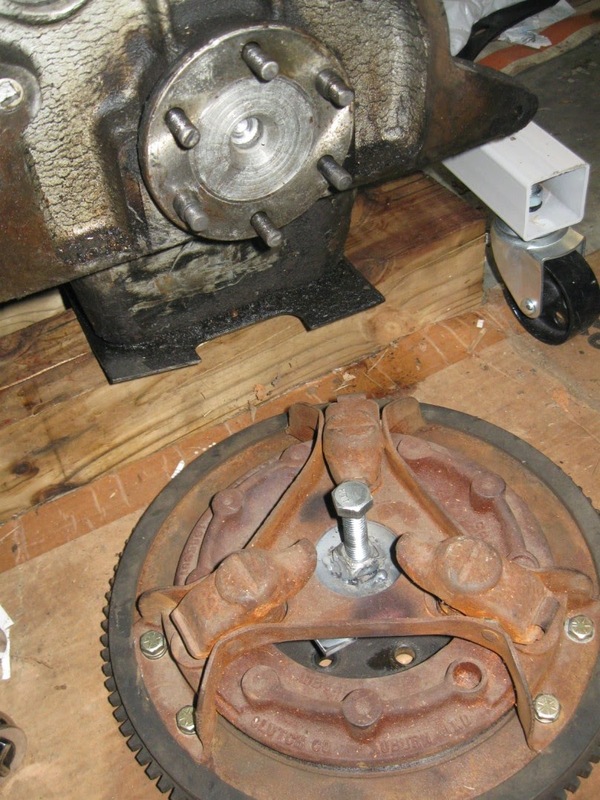 The flywheel is held on by bolts, so removal should be simple. Not so fast. The flywheel fits on a hub at the end of the crankshaft and it is a tight fit. No matter how we pulled, pushed and banged with a hammer, it wouldn’t budge. Off to the internet for some advice. The majority of advice was to “keep banging”. However, there were those who said to use a puller. A search of the internet didn’t turn up a single flywheel puller for an L-134 engine. We have a few pullers that we have used to pull brake drums and steering components. None of them were large enough to work on the flywheel. It appeared it was going to be necessary for us to design our own puller. We don’t have metal working tools, except for drills, saws and, of course, welders. So the challenge was to come up with a simple design. The first problem was figuring out how to attach the puller to the flywheel. In a flash of “duh”, Barry figured he could use the clutch attachment holes. A typical puller has a method of attaching to the object and a screw device in the center to apply pressure on the shaft. The clutch attachment holes are in a triangle configuration, so we figured we could weld and drill some melt strips. As Barry was taking some measurements, he spotted the old clutch pressure plate. That was when the second “duh” moment happened. We had a used pressure plate that had been in a box of parts we purchased. Barry took a scrape piece of ¼” x 3” steel bar and cut it fit inside the back of the pressure plate. He first drilled a hole and then welded a ½”square nut in the center of the pressure plate and inserted a ½” bolt. With the plate welded to the pressure plate and the plate bolted to the flywheel, all that was left to do was to use a socket wrench to apply pressure to get the flywheel loose. It took several turns, but the flywheel did pop off. Clearly the heavy rust had resulted in “rust weld” and we aren’t sure any other method of removal would have worked as well. There were a few components to be moved from the old engine to the new. Although we had lots of room to remove and install the engine, we decided not to move things like the generator until after the basic install. Using are handy clutch alignment tool the new clutch assemble was in place in minutes. So now all we had to do was to drop the engine in and slide it back on the transmission shaft. We used the clutch alignment tube to align the clutch disk and the transmission shaft so the engine should slide right in. Should was the operative word. We pushed, twisted and shoved, but the engine would go so far and then stop. We pulled the engine back out and re-checked the alignment. We even put a level on the motor to make sure the motor and the transmission were on the same plane. Again, we would get the engine within an inch and it wouldn’t move. Time to stop for lunch and beers. Beer makes everything better. At least that is what we have been told. All we know is that after lunch and a beer, Evan just leaned against the motor. And it slid in place. It must have been the beer. We have no other way to explain what happened. In any case we are making the beer frig an official tool box. With the engine back in place, we took our time getting everything back together. While the new engine had lived on an engine stand, it didn’t need a generator or accelerator. So in addition to the normal connections, we had to add a few things to the motor. 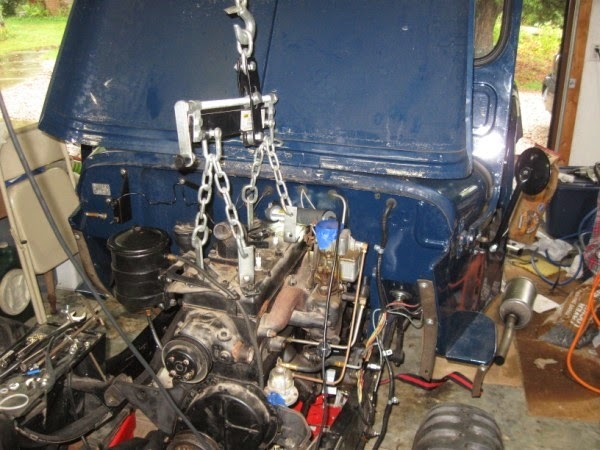 Having taken lots of pictures of the wiring and general engine compartment made life easier. The rest of the install was uneventful. With the essential wiring done (we could wait on the lights) it was time to see if the engine would start. It had been sitting on the garage floor for months, but a few cranks to get fuel to carburetor and it fired! The engine sounded great, with good solid oil pressure. With the engine running, Evan let out on the clutch and no noise! The clutch problem was solved! We piled in and each took a turn at driving the jeep on the road. What a great feeling! Next PostNext Pumps, Plows and Prizes!